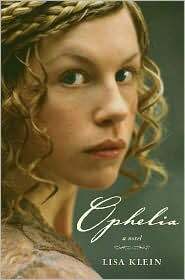 Ophelia, by Lisa Klein, is a retelling of William Shakespeare’s Hamlet through the eyes of the world’s most famous spurned lover. A young and blossoming girl, Ophelia catches the eye of the dark prince Hamlet, and the well-known story unfolds with just enough innovation to make it interesting. We get a far more in-depth picture of Ophelia. The book spends a somewhat excessive amount of time describing her alabaster skin and lithe figure, but beyond that her thought-processes and intelligence are explored quite completely. She is no longer a pale, watery mystery, writhing blurrily in tragedy and madness. She is calculating, intelligent, and stifled. As she says in a bout of frustration, "The wild doe has become a gentle deer. I fear I have been forcibly tamed." Ophelia is youthful, ripe, lovely and restlessly clever. The author did a great job of blending the ideal of a young girl as a blooming sexual object with the well-tested narrative of a girl who wants a life bigger than she is allowed. Ophelia won’t stand for becoming a lady. She wants out of the castle, out of her limited life. And she will achieve this in ways that --given Ophelia’s stigma-- may surprise the reader. The first half of the book is fast-paced and compelling. It chronicles Ophelia’s childhood and whirlwind, frightening and magical love affair with Hamlet. They are intellectual equals, and while they once enjoy a relationship solely based on their love and their fantasies for the future they will have together, it becomes an affair spurred on by a spark of madness. They twist through a black maze of heat and passion and the constant possibility that the person in their arms will suddenly morph into a ghost-possessed demon. What is madness? How does it spread? How does it infect? Is it always there, festering, waiting, or is it a malady foreign to the natural mind? Ophelia watches as her bright and brilliant Hamlet dances along the path of madness—assuring her he is merely playing, pretending and scheming to achieve his goals. He is above it all, he is in control. But it is a steep and slippery slope, and Ophelia watches as her love and equal becomes a creature unknown to her. And it is exciting and it is beautiful and it is breathtaking. But so, so frightening. Is madness inborn? Can it be faked? Is there a line between true madness and the trickery of the mind? These questions are explored directly and indirectly throughout. That was something the book does very well. Unfortunately, after the wonderful first half, the book loses much of its momentum. It meanders and drags, and I found myself having to force myself to read. Yes, there is a great little twist that skews the well-known story and completely changes where the latter part of the book goes—but the novel fails, after the initial idea, to follow through and make it interesting. It devolves into immoderate pockets of unnecessary description and repetitive pages that weren’t really interesting in the first place. If you can make it through the duller second half, the beginning of the novel is definitely worth a read. It will be significantly more rewarding if you are familiar with Hamlet, however. 2 and a half evil daggers. Hello and welcome to 3 Evil Cousins, where we plan to bring you reviews, interviews and the occasional essay written by teens and for teens. Try out our new chat feature, let us know what you're reading or what books you can't wait for and get in on our evil plot to make YA into the biggest section of the bookstore.
. . . As Our Evil spreads. . . MWAH HA HA HA! Authors who have deigned to talk with us. Thanks for dropping in. Really. All written content copyright '08 3EvilCousins except where noted. All posts and reviews are copyrighted by their respective authors. All Rights Reserved, permission to reprint may be granted on request.